The increasing growth in the use of e-learning environments, in which education is delivered and supported through information and communication technologies, has brought new challenges to academic institutions. From all the current definitions of e-learning, it can be seen that learning contents are one of the key issues for a successful e-learning experience. Therefore, there is a real need for academic staff, managers and librarians to re-think the whole process of delivering courses, information resources and information services. 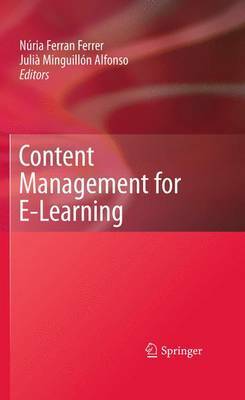 The book focuses on defining content management and its relationship with knowledge management, providing perspectives on how the semantic web could complement content management, how to deal with copyright restrictions, and how to describe information competencies and skills required and acquired by teachers and students in virtual environments. Offered is a design project for managing digital content for classical and distance education institutions, covering all the aspects related to the content lifecycle, integrating it into the learning process. Practical aspects such as standards for content e-learning management, a review of existing experiences of learning repositories, and a survey of available platforms for delivering courses and providing access to information resources is also covered. Lastly, the book addresses the three main factors which make it crucial in the current context: first, the web 2.0 paradigm, which breaks the content producer-consumer barrier; second, the open content movement for educational purposes, which changes the knowledge management transference model; and third, the new European Higher Education Area, where the concept of content needs to be rethought.